John Ford made something like 125 films in his fifty-year career in Hollywood, and in that time he created a cohesive, wholecloth world, especially in films of the American West. Sam Peckinpah worked in feature films from The Deadly Companions (1961) to The Osterman Weekend (1983); a dozen or so films, as well as television beginning in the late 1950sâ€”a little over twenty years of work. Yet Peckinpah’s legacy is as rich as any modern director’s, and as unmistakable; you always know when you’re watching a Peckinpah movie. And Peckinpah did his most important work in the Western. But it may be more appropriate to say that Peckinpah made end-of-the-Westerns. His Western films are poised at the moment of death, the passing of one life, one era, to another (maybe that’s why he used slow-motion to show his characters getting killedâ€”he was saving, examining that final moment). The Wild Bunch (1969) is one long last gasp; the American West is disappearing, to the extent that the outlaw heroes must go to Mexico, where they find a brief glimpse of Eden. Pat Garrett and Billy the Kid (1973) is explicitly constructed as an American folk ballad (Kris Kristofferson and Bob Dylan are among the actors), the stanzas of which describe two old friends who used to live a wild, wide-open life. Now, one of them has joined the side of the law, and has betrayed the other for the sake of employment and civilization. In The Ballad of Cable Hogue (1970), the hero, a man who has a waterhole in the middle of nowhere, is killed byâ€¦ a motorcar. Peckinpah’s sympathies seem divided. The civilized homestead of the Knudsens is a place of heavy religious repression. But the mountain lair of the Hammond boys is no Eden, rather a place of perverse brutality. There seems to be no place left for Judd or Westrum; all that remains is an individual code, the shreds of a personal sense of integrity. 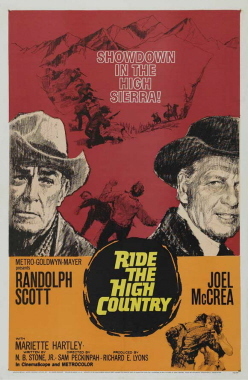 Ride the High Country is the one Peckinpah film that almost everyone agrees is a masterwork. It has little of the apocalyptic violence of his subsequent movies. Though what his critics never seemed to understand was that Peckinpah was interested in what happened before and after the violence, and the deep well of pain from which the violence emerged. (He once said, “Conflict in drama is necessary. Sometimes it’s violence, sometimes it’s in words; sometimes the worst thing in the worldâ€¦ is the failure of loveâ€¦.”). It is strange to think that Peckinpah has been dead for six years, that his filmsâ€”or even the mere mention of his nameâ€”probably no longer cause controversy and bitter arguments. He surely had a few more movies in him, but his careerâ€”thanks to a mutually hostile relationship with Hollywood, and his bad healthâ€”got cut off at the pass. We are lucky he made his wise winter film, Ride the High Country, at the beginning.